Sidcup, London. 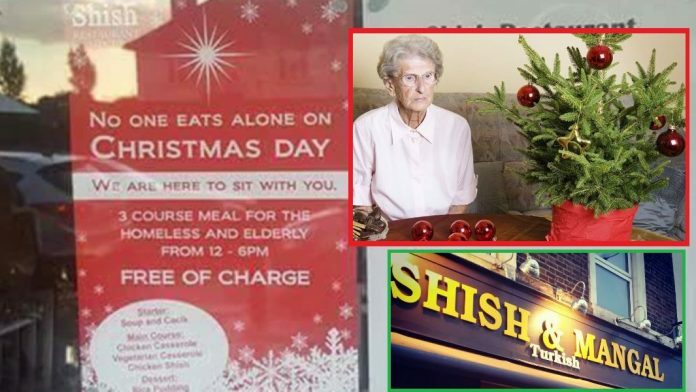 A restaurant has decided to take the unusual step of opening its doors and offering food on Christmas Day. Unusual but no unheard of. After all, London is a multicultural and multi-faith city with many non-Christians. But this story is different. They plan to GIVE AWAY food. That’s right, ‘Shish‘ plan to offer sanctuary to lonely people, homeless people and elderly folk with no family this December 25th. There’s a six hour window where anyone fitting the criteria come along and enjoy a tasty three course meal for nothing. They’ll be serving up soup as a starter, chicken shish kebabs or vegetarian casserole for mains and rice pudding for dessert. There’s no actual Christmas dinner because the people at Shish are Turkish and are more experts in their own cuisine. Now people from all over the world, not just London are commending their work. Well done, guys! What a beautiful gesture, huh? Next articleHero Dog Calls 911 Before Pulling Owner Out Of Burning Building!